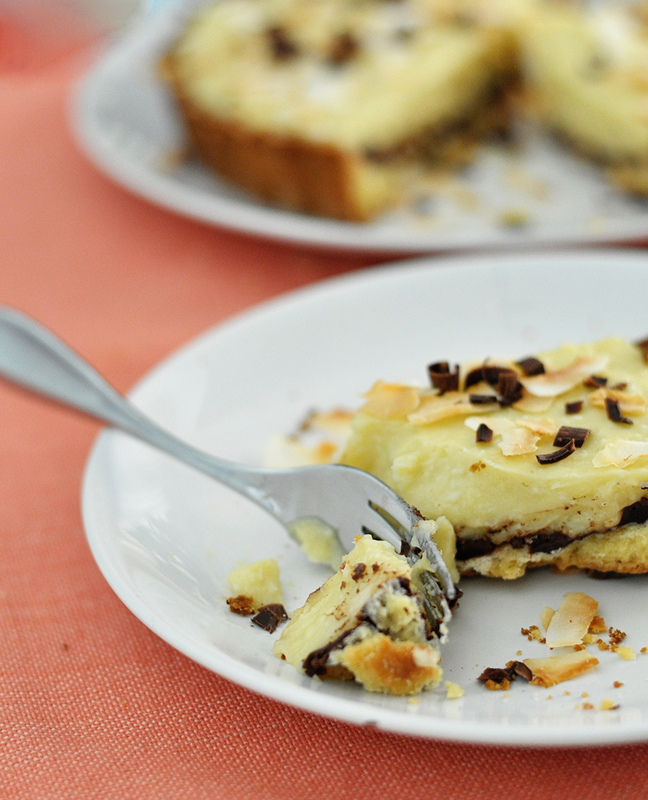 Black Bottom Coconut Cream Tart - Real life, on purpose. David doesn’t make food requests very often. Every now and then he asks for red meat, since it’s not a frequent ingredient in our meals these days. Sometimes he’ll ask for chocolate chip cookies, although probably 80% of the time he’ll just make them himself if he gets a craving. Mostly, though, he’s happy to eat whatever I decide to cook. Which, given how difficult it is to convince certain smaller members of our family that tasting their dinner will not actually kill them, is really nice. When I find a new recipe to try, he’s always willing to give it a chance. He’s lavish with his praise when it’s delicious and keeps his mouth shut if it’s not. (Unless I ask, and even then he’s gentle in his criticism.) Plus he steps in to take care of family food duty–whether it’s fixing meals, grocery shopping, or grabbing takeout–if I just plain don’t want to do it. Because he’s so easygoing, I’m more than happy to fill his infrequent requests. Even when that request is kind of complicated and takes a while to make. Or when it means turning on the oven in August when we live on the surface of the sun. Or when it means stirring coconut custard over a hot stove while the children run around shrieking like banshees because I don’t want it to get clumpy or burnt. I know it sounds weird, but food plays an important role in our marriage. It’s my love language. I know I joke about that a lot, but it’s true. Making and sharing delicious food with my husband is one of my favorite ways to show I care about him. Lucky for me, he speaks that language too. And it doesn’t hurt that I get to enjoy the results of my efforts too. Yummm. Preheat oven to 425°F. In a medium bowl, whisk together dry ingredients. Using a pastry blender, cut in butter and coconut oil until fully combined. Add egg yolk and milk/cream, and continue mixing with pastry blender until there are no dry bits and dough sticks together. Press dough into a 9-inch tart pan. (Dough will likely be very soft, so you may want to flour your hands to prevent them from sticking.) Cover with foil and fill pan with dry beans or some other pie weight. Bake 20-25 minutes or until shell is golden brown. Note: I DEFINITELY overbaked my tart shell. It still tastes great, but it’s pretty crumbly and hard to cut into when it’s as dark as you see in the photos. While the tart shell cools, prepare ganache. In a microwave safe bowl, microwave chocolate in 10-15 second intervals, stirring after each, until completely melted. Stir in cream until fully incorporated. Ganache should be thick, smooth, and glossy. Spread evenly over bottom of warm tart shell and allow to cool while you prepare the coconut cream. In a medium sized saucepan, whisk together coconut milk, milk, and sugar. In a small bowl, whisk together eggs, cornstarch, and salt. Cook milk mixture at medium-high, stirring frequently, until very warm but not yet simmering. Spoon a small amount of milk mixture into egg mixture and whisk together until fully incorporated. Add a few more spoonfuls of hot milk to the eggs to temper them (warm them up without cooking them; you don’t want chunks of scrambled egg in your custard), stirring well each time. When egg mixture is fairly thin and warm, add it to the remaining milk mixture and cook until very thick, whisking constantly. Remove from heat and add extracts and shredded coconut. Stir well. Pour into prepared tart shell. Garnish with toasted coconut and/or chocolate curls. Allow custard to cool and set for at least 20 minutes before serving. Cover with plastic wrap and refrigerate if not serving immediately. 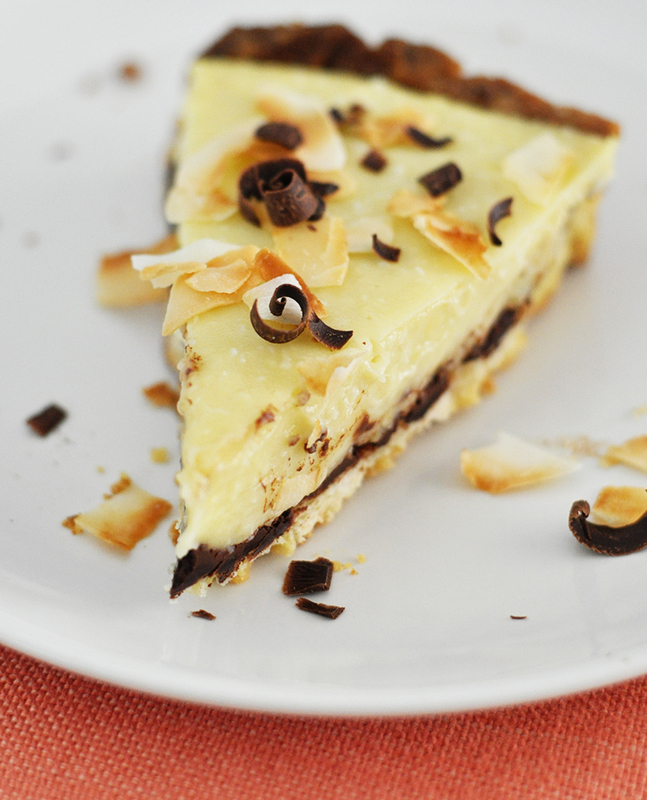 This coconut cream tart can be stored for up to three days, tightly covered, in the fridge. *I use unrefined cold-pressed coconut oil because I like the coconutty flavor it adds to the dough. Mine was also completely liquid when I used it because my kitchen is like a furnace in the afternoon. The dough turned out great, if a little soft and sticky, so I wouldn’t worry too much about whether you use solid or melted coconut oil. 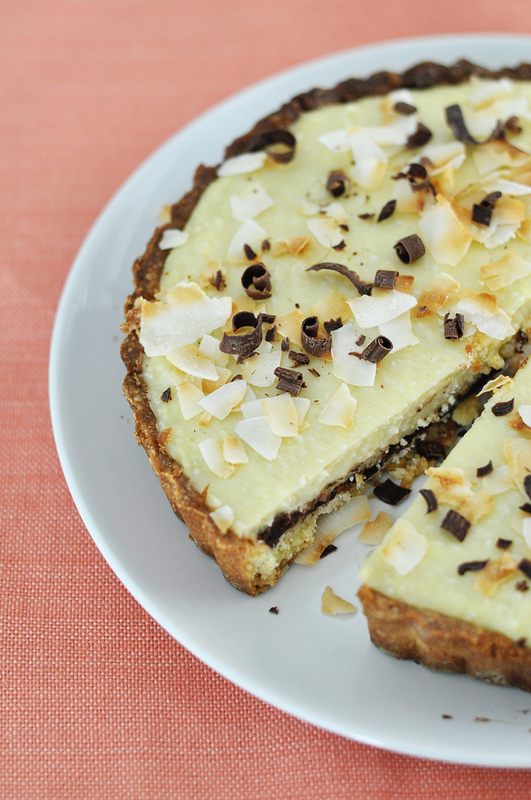 **I used full-fat coconut milk and whole cow’s milk because custard should be creamy. I can’t vouch for the texture of your custard if you use lower fat versions. If I had to choose, I’d use low-fat cow’s milk and full-fat coconut milk. You do you. ALSO: I mixed finely shredded coconut into the custard, which is why it might look “lumpy” instead of “stringy” like shredded coconut usually does. I find it in the bulk bins at Winco but maybe you could get similar results using a food processor? I toasted some fat coconut chips for the garnish on top. You could totally use regular shredded stuff for both. I’m just a weirdo who likes to make things as complicated as possible. Maybe this is a weird question, but is food important in your marriage? Or is it just a necessary part of, you know, staying alive? Does it bring you together or cause lots of stress in your relationship? Who does most of the cooking at your house? Or do you split kitchen duties evenly? Or do you just eat out because neither of you likes to cook? I love being in the kitchen, I love futzing with recipes and adding my own considerable flair. I feel lucky that I married someone who loves vegetables and will eat almost everything I cook; he has his food quirks, but most of the time I don’t mind. Except, for the last almost-a-year he has been on this weird fad-like diet where he eats envelope/packet food (that just-add-water crap, or 100 cal bags of fake chips, or bars, or whatever)….he hasn’t stuck to it exclusively, but for the most part, that is how he eats now. And it is really really hard for me. He skips eating with me often because he eats 6 or 7 small meals and the timing doesn’t line up with my dinner needs. Or, when he does sit with me, he is done in less than 3 minutes, takes his plate to the sink, and goes off to do whatever….I don’t like spending time making a delicious something only to eat it by myself. So….we’re working on it. Sigh. That sounds…difficult. And a little weird. Like, why? Isn’t fresh, real food better for you than stuff in a packet? Ah well. He gets to choose. And I hope you can work something out so mealtimes are more enjoyable for both of you. Um please call me next time you make this. I could have written a lot of this post- Aaron is a lot like David and I’ve often said that food is his love language (he literally doesn’t have one of the normal ones. Engineers, I tell you). Making him a dinner he likes is the best thing I can do for him to show I care. Food is a super important part of our marriage!